Next Tuesday, January 8, The Broad in Downtown Los Angeles (not that Broad Museum), Eli Broad's new contemporary art museum with an arresting net-like "veil" facade by Diller Scofidio + Renfro, will top out at the corner of Grand Avenue and Second Street. The project is set to open next year and will contain 120,000-square-feet over three-levels, including 50,000 square feet of gallery space on two floors, a lecture hall for up to 200 people, a public lobby with display space and a museum shop. As usual, the topping-out ceremony will include a theatrical event: in this case, the "flying of the beam," in which a 294-foot crane lifts the final steel beam to the top of the structure. (In the meantime, take a fly-through of the new building in this video rendering.) In addition to Broad and DS+R, others on hand will be LA Mayor Antonio Villaraigosa as well as 100 construction workers for the project. You can watch a live construction cam of the project here. AN also learned that Related California will break ground on its new Arquitectonica-designed apartment tower on January 10, just two days after the Broad event. The 19-story building is the first major piece of the long-delayed Grand Avenue project. No more details on the event, but there are sure to be some fancy shovels and some bigwigs on hand. That's some heavy symbolism for the transformation of downtown's long-troubled Grand Avenue. Yes, it's really happening. 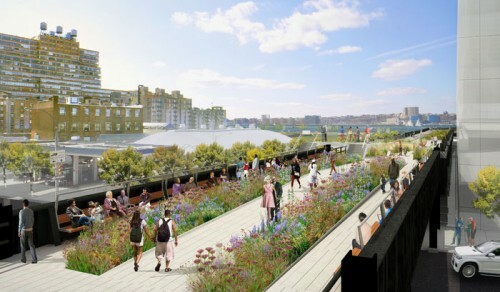 Everyone loves a fresh High Line rendering, prompting a leak of the latest batch—complete with giant "Not for reproduction" text scrawled across the images—last week via DNAinfo. Now that the cat is out of the bag, the High Line released officially approved renderings yesterday that are crystal clear and text free. Changes from the designs released in March predominantly show refined detailing by James Corner Field Operations and Diller Scofidio + Renfro. The delightful rubberized I-beam section for the kids has more planting and the final wrap-around interim section features a few new set of scalies, but the temporary solution remains much the same, with a lean walkway overlooking the self-seeded rail bed. Today the City and Friends of the High Line announced the acquisition of the third and final portion of the abandoned rail line from CSX, securing once and for all its future as a linear park. The section, which extends into what will become Hudson Yards, will add another half mile to the leafy line. CSX donated the line to the city. Final design work for the third phase is underway. Construction is set to begin later this year. 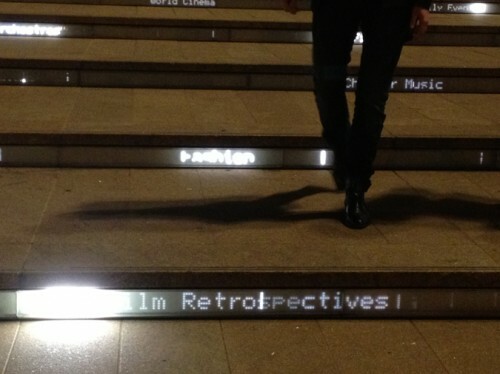 Design studio Diller Scofidio+Renfro (DS+R) has certainly had a very good week. 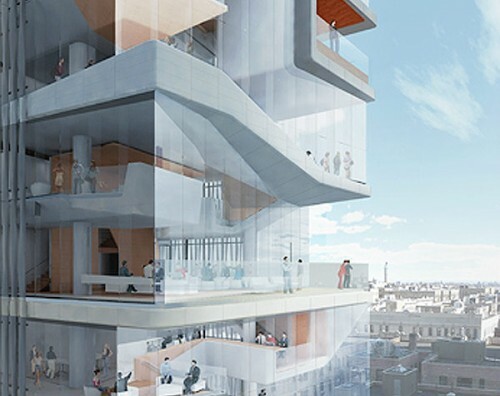 As we noted yesterday, the firm’s designs for the Columbia University Medical and Graduate Education Building in Washington Heights have just been released, and now today, the Cooper-Hewitt National Design Museum has announced that DS+R will be working with museum staff on the redesign of the museum’s exhibition spaces that are currently under renovation on Manhattan's Upper East Side. 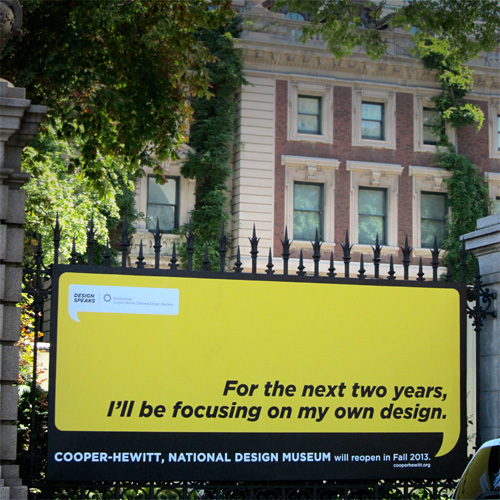 The Cooper-Hewitt closed last July for an extensive, two-year face lift and is currently undergoing an extensive reprogramming that will increase the amount of exhibition space by 60 percent and rearrange the institution's functional divisions. Gluckman Mayner Architects, with executive architects Beyer Blinder Belle are responsible for the restoration and renovation of the institution's historic Andrew Carnegie Mansion and two adjoining row houses on 90th Street and Fifth Avenue. While the buildings are reprogrammed and historic features preserved, DS+R will be responsible for designing the new exhibitions contained in those spaces. Along with media designer Local Projects, DS+R is responsible for the visitor’s experience in both the permanent exhibition rooms on the first floor and the temporary exhibition spaces on the second and third floors. At this point in the process, neither the collaboration between Local Projects, DS+R, and the Cooper-Hewitt, nor the scope of the final product, has been decided. Stay tuned to AN for updates on the new exhibition spaces as they emerge. Medical and Graduate Education Building Architect: Diller Scofidio + Renfro Architect of Record: Gensler Client: Columbia University Medical Center Location: Haven Avenue and 171st Street Groundbreaking: Early 2013 Completion: 2016 Columbia University Medical Center has unveiled plans for the Diller Scofidio + Renfro-designed Medical and Graduate Education Building on its campus in Washington Heights. Visible from nearby George Washington Bridge and Riverside Park, the 14-story tower will become a major landmark in the skyline of northern Manhattan, with a south-facing multi-story glass façade punctuated by jutting floorplates and exposed interior spaces. The building will house the four schools of CUMC along with the biomedical departments of the Graduate School of Arts and Sciences. The building will feature technology-enabled classrooms, operating rooms, and other real world clinical environments, collaborative and quiet study spaces, an auditorium, student lounges and cafes, and multiple outdoor spaces, all woven into the spiraling system of floor plates expressed on the structure's exterior. Social and public spaces are stacked along a central circulation stair dubbed the “Study Cascade” running the full height of the building. The Study Cascade holds a system of alcoves designed to foster collaboration and team-based learning and is clad in cement panels and wood, occasionally piercing the glass southern facade with protruding balconies and terraces. Classrooms, clinical simulation space, and administrative offices are housed in the northern face of the tower. “Spaces for education and socializing are intertwined to encourage new forms of collaborative learning among students and faculty, ” Elizabeth Diller wrote in a statement The tower will serve as a visual landmark for the northern limit of Columbia’s medical campus and its announcement follows the release of plans for the school’s Manhattanville expansion to the south of the new building. Construction on the tower is expected to begin in early 2013 and will take approximately 42 months. Columbia hopes the building will meet LEED-Gold standards for sustainability. 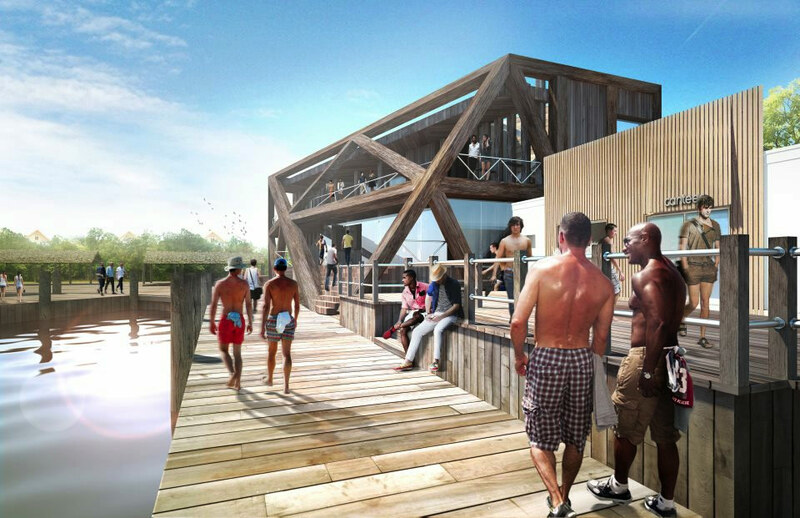 Facebook was aflame this morning with new renderings by HWKN (Hollwich Kushner) for Fire Island's notorious Pavilion, the entertainment complex that burned down last November. In January, it was reported in The New York Times that Diller Scofidio + Renfro were signed on to do the master plan for the marina, of which the Pavilion sits at the center and serves as the social hub. Amidst rumors that the complex's most recent owners, Andrew Kirtzman, Seth Weissman and Matthew Blesso, were more intent on selling the property than building there, the new renderings are a tantalizing tease of what could be. Indeed, the town center, such as it is, has always stood in humble contrast to high stylings of homes hidden behind thickets of bamboo. Architect and historian Christopher Rawlins, whose upcoming book on Horace Gifford highlights several houses in the Pines, noted that since the 1960s the marina was always well-used if utilitarian. 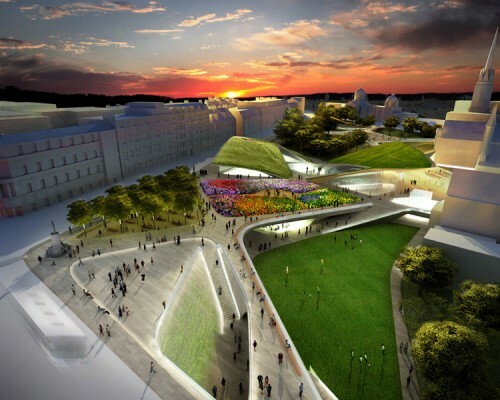 The new complex would represent a definitive shift in the culture, both local and at large. "It would be the first instance of distinguished commercial architecture in a place that up to now has only had distinguished residential architecture," said Rawlins. In addition to Gifford, Andrew Geller, Harry Bates, and Earl Combs all built on the island. 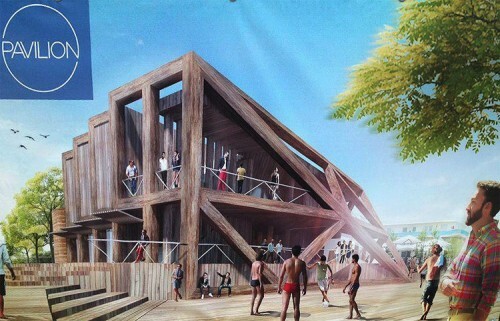 A reliable source told AN that the new designs would include prefab elements alongside the rough-hewn wood. The space would also be amenable for open air weddings as well as an air conditioned/soundproofed area for late night debauchery. Designs for the temporary structure for this season are reportedly being held up by permits, though HWKN certainly have their pavilion (lower p) cred through designs for PS1. While cameras allowing real-time viewing of work on downtown LA’s Broad museum have been in place since construction began last fall, the scenery is finally getting more interesting. 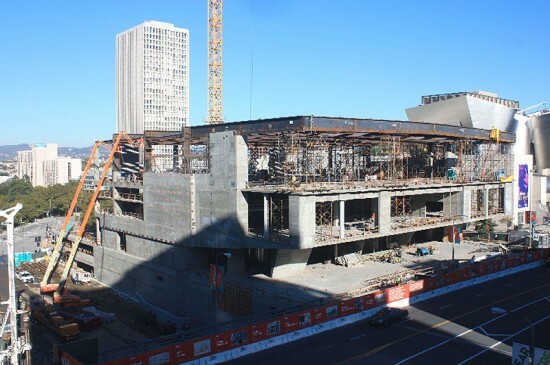 The structure’s parking garage is now complete and construction permits were recently approved for the museum itself, according to LA Downtown News. The intricately-clad concrete building, designed by architects Diller Scofidio + Renfro, is on schedule for a late 2013 completion. The three-story structure will include about “50,000 square feet of gallery space on two floors, a lecture hall for up to 200 people, and a public lobby with display space and a museum shop,” as described by the Broad Art Foundation. The budget is $130 million. 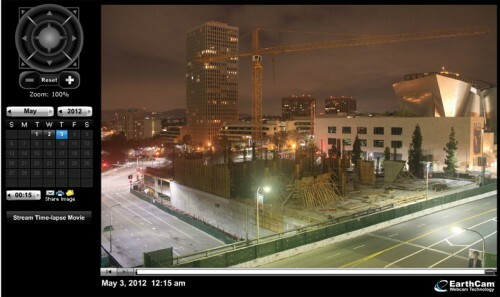 The Live Construction Cam at the Broad Art Foundation site is accompanied by time-lapse camera capturing high resolution pictures updated every 15 minutes. The site also allows viewers to stream a time-lapse movie documenting progress on the site over time. Design for Final Segment of High Line Revealed! Tonight, the design team from the High Line will present plans for Section 3 to the community. Parks Commissioner Adrian Benepe will introduce James Corner from the project's lead team, James Corner Field Operations, and Ricardo Scofidio from Diller Scofidio + Renfro. 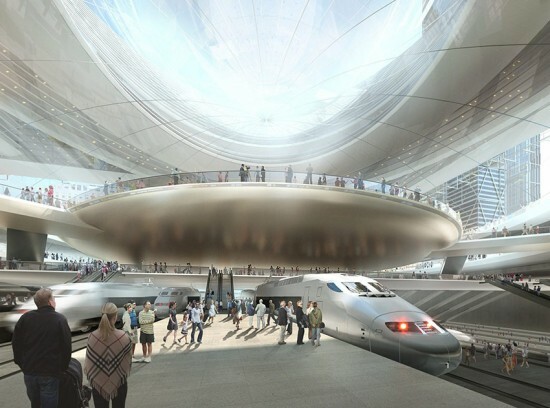 High Line co-founder Robert Hammond will moderate a post presentation discussion. Unlike the last two sections of the High Line, Section 3 will be intimately integrated with one major developer, as opposed to a variety of property owners and stakeholders. From 30th to 34th Street, the High Line wraps around Hudson Yards, the 12 million square foot office and residential district being developed by Related Companies. Much of the new section will be built cheek by jowl with Related's construction. At the westernmost section overlooking the Hudson River, an interim walkway will span the existing self-seeded landscape, so as coordinated design efforts alongside Related's development and give Friends of the High Line time to raise more funds. The estimated total cost of capital construction on the High Line at the rail yards is $90 million. Construction is expected to be complete by the end of 2013 with a full public opening in spring 2014. 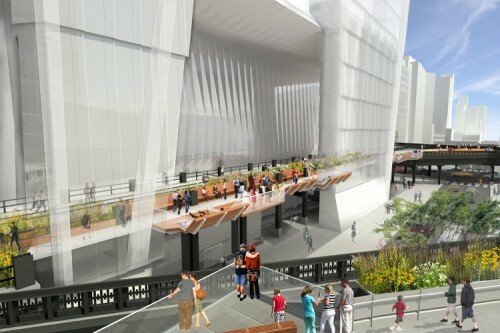 All renderings courtesy Friends of the High Line. Click on a thumbnail to launch the slideshow.